India vs Australia 5th ODI highlights: Chasing a target of 273, India were all out for 237 and Australia recorded their first bilateral ODI series win in the country since 2009. ...this loss will hurt. But think about this series as a cricket fan and you would notice that this has been one of the most extraordinary ODI series you would have seen in recent times. Even the likes of Bangladesh and Zimbabwe would have been given more respect by fans and experts than this Australian team were before the first match. They didn't do much to show that they deserved anything more in the 1st and 2nd ODIs but after that, look at what they have gone and done. We leave you with the report, thanks for sticking around, ciao! "Unbelievable, the resilience and fight we showed, being 0-2 down, it would've been easy to roll over, but the fight we showed makes it a great achievement. Proud of the group. If you just go with attacking batsmen in these conditions, you'll struggle. You need good batsmanship on these wickets. I've been coming here for a while now, trying to win, hadn't happened. That's why this makes it special. People have written us off for a while, we knew the style and plans we wanted to play with are all there and can win us the World Cup. It's about believing we're good enough, we did that in four out of the five games. Great series all around." "Scoring hundreds is even more fun if you win games," he says. "Never easy to beat India at home, so we're very excited. We all adapted really well, end of the day, it was a really good team performance. Even when we lost the first two games, we had great vibes in the camp." "We certainly thought it was a gettable target, they got away from us in the end, 15-20 more than what we could have kept them to. Overall, Australia deserved to win, they played with more passion, hunger and heart. Were brave in pressure situations, they way they raised their intensity meant they were deserving winners. We didn't even consider dew in this game, can't predict these things. Can't take any excuses, have to live up to the potential. It's good we have had these losses, to correct these at the World Cup. The guys will reflect on this series quite a bit, been playing a lot of games on the road. Can be proud of the cricket we've played last few months, series didn't go well yes, but we've played well. We're more or less sorted, now it's about giving guys their roles and expect them to stand up. Maybe theree's just one spot we've to discuss. Last three games, the idea was to give fringe guys some time and see how they react. No excuses, we're expected to raise our standard of cricket. The changes will never be an excuse. We will take a lot of confidence going into the World Cup." "All the credit goes to the players, we help prepare them. They have to perform under pressure. Incredibly proud of the boys. Unless you're the selectors, tough to pick the squad. Been an incredible arm wrestle right from the time India arrived in Australia in the summer. For us to win this series is incredible for Australian cricket. They showed great character, if you look over the whole summer, we've played about 17 games against India. India had the better of us in Australia and we were able to have the better of them here. I think Jhye Richardson and Pat Cummins are developing into a great partnership, Usman Khawaja hasn't played a lot of ODIs but is a class act, he's got himself so fit. Credit goes to him for showing the discipline to get to where he is. You can name the whole group, they've gone a great job." Marcus Stoinis cleans up Kuldeep Yadav off the final ball of the match, Australia have won their first bilateral ODI series in India since 2009. Shami goes for a yaba-daba-doo hook, ball takes the upper edge and balloons almost vertically up in the air, Richardson sprints forward after his follow through and takes the catch. Australia are one wicket away now. Richardson takes the next and that has to be that. Kedar pulls and sends it straight to deep midwicket. That is the end of a remarkable fightback. Cummins with the breakthrough and Finch symbolically takes the catch. Cummins bowls it full, angling in at the toes, Bhuvneshwar ends up scooping the ball up in the air, straight down the throat of mid-off. India 223/7, need 50 to win off 24. By the bowler Richardson. A very difficult catch to pull off, Richardson had to dive to his left and it was dipping on him. Bhuvi had a hit a six off the previous ball. Just four runs off that over and, more importantly, no boundaries. This is still a long, long shot for India but Kedar Jadhav has shown that only an injury can keep him away from a seat in that flight that goes to England in May. They need 73 to win off 42 and Cummins has been brought back into the attack. Kedar and Bhuvi are leading one of the most remarkable turnarounds you would get to see in ODI cricket but there is still a long way to go. Don't move from your spots. Jadhav clears deep square leg and sends Maxwell over the ropes. Hello then, we have a chase in our hands, this partnership is now India's highest of the innings. Two fours in the same and this time it's Bhuvneshwar Kumar! He slices Maxwell through point. Just before that, Maxwell and Kedar collided at the nonstriker's end while the former tried to collect the ball that was sent down the track by Bhuvi. The Kotla crowd has found it voice again because of all this. Kedar Jadhav charges down the track and sends it hurtling towards long on. That's a reminder of sorts from him, "I'm still here folks." India ned 110 runs to win from 78 balls. The required rate is north of 8.5 and the current rate is south of 4.4. And if one of these two batsmen get dismissed now, we go into one of the most fragile tails in world cricket. India 146/6. Kedar Jadhav and Bhuvneshwar Kumar in the middle. Australia are absolutely on top. In the previous decade, this was a rather familiar position for the Indian fans when their team is playing against the Aussies. Is this series a sign of things to come? Jadeja this time, Zampa gets a second in the same over and his third of the match. It is a gem of a delivery, drifts in and then spins away to deceive Jadeja completely, Carey sharp once again behind the stumps and India lose another. What an incredible comeback this has been from Australia in terms of this series. Is that the game? Rohit goes forward, Zampa sees it and shortens his length, batsman misses it completely and Carey finishes it off with a brilliant stumping. India are in rough waters now. 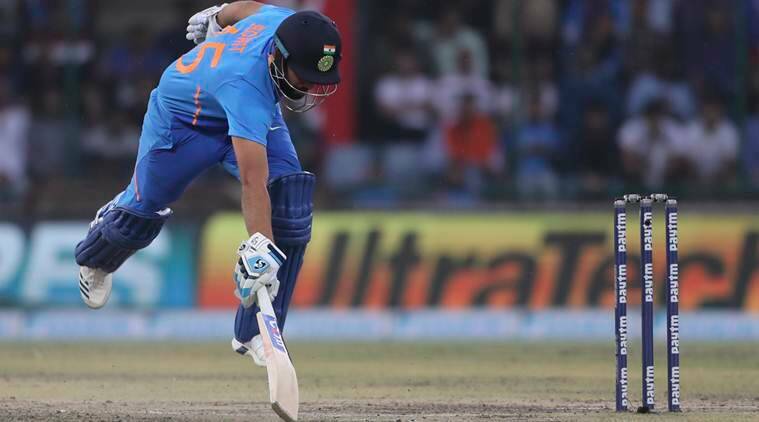 Rohit Sharma hits it to straight to cover, the ball is at knee-level for Maxwell and he fluffs it. Not an ideal thing to do when you have Rohit in the middle and need him to score runs. He hit a six off the previous and tried to go again but this time, Zampa drops it short and the ball takes Shankar's outside edge. It balloons up and long-on takes the catch. India in serious, serious trouble now. India's milestone man has got another record in his kitty. He is the third fastest alongwith Sourav Ganguly to get to the milestone. Pant smashes Zampa over deep midwicket, it goes over the ropes for a six and India are into the nineties. This is a healthy little partnership right here. 16 overs have gone. That wicket of Kohli is a big booster for Australia but they have a long way to go still. India remain abreast of the required rate, Rohit Sharma and Rishabh Pant are in the middle. Sharma is on 35 now and is 11 runs away from crossing the 8000-run mark in ODIs. India 80/2. If there ever was a way to silence a Delhi crowd. Stoinis sprays it wide, Kohli chases it and ends up nicking it behind. Stoinis has got the big wicket and the Australians are away! And it had to be Pat Cummins who bowls it. These first 10 overs have been a good competition so far. Kohli and Rohit have done well to fend off Cummins who has been spitting fire. India 38/1 after 9. ...India are 31/1. Cummins has been relentlessly hitting the deck hard and got Rohit on the fingers once. But Rohit and Kohli have been maintaining a run rate north of 5 consistently now and so India are currently in a good place. Absolutely ridiculous from Kohli. Cummins pitches it up and Kohli stays in his crease and caresses it through the onside with the calmness of an old man taking his dog out for a walk on a lovely Sunday morning. OUT! DHAWAN NICKS IT BEHIND! No consecutive hundreds for the opener. India 15/1. Back of a length, darts away from Dhawan, he goes after it and ends up getting an outside edge to the keeper. The batsman does not wait for the umpire's finger to go up, India lose their first wicket. In comes the prodigal son Virat Kohli. India 15/0. Rohit Sharma seems a little unsure of himself at the moment but Dhawan seems to be at ease. It is his home ground after all and the crowd would be looking forward to see the likes of him, Kohli and Pant go big guns today. Dhawan goes after Richardson. Rohit takes a single off the first ball and the second is a dot. Richardson pitches the ball up on the leg stump and Dhawan sends it to the square leg boundary for the first four. He then smashes the next ball through cover. Such was the power on the shot that none of the multitude of fielders standing on the offside could stop it. India 11/0 after 2. Rohit Sharma and Shikhar Dhawan take guard, Pat Cummins starts the Australian attack. Just one run came off that first over. Khawaja said, "Nice to get a competitive total. We have lost a few wickets in the middle, but that partnership between Jhye and Patty was really good. When I was out there, I was thinking 280, it's one of those wickets that is gonna get harder and harder. Hopefully we will bowl well and field well. The wicket is wearing and hopefully it will keep wearing. We will do things that are under our control and hopefully bowl well." Last ball of the innings and that's out! Australia end their innings on 272/9. The visitors looked poised for a 300+ score at one stage but the Indian bowlers were successful to restrict Australia, who manage 44 runs off the last 5 overs despite losing 3 wickets. Can India chase down the target of 273 in Delhi to win the series? 272 is a very good score on this pitch I reckon ! Who’s dressing rooms would you rather be in now, Aust or India’s ? Thoughts followers ? Four back-to-back boundaries by Jhye Richardson and Australia bring up their 250 with loss of seven wickets after 48 overs. Pat Cummins slapped one straight back past the bowler, leaving that fielder with no chance. A good over for the visitors, 11 runs off this one. Australia are 241/7 after 47 overs. The slowness of the pitch and some excellent bowling has made batting difficult and the total below where it was headed. But won't be easy to chase if there isn't any dew. WICKET! Shami picks up his second as Carey is caught behind for 3. India continue to fight back with the ball. Australia are 229/7 after 45.5. 2 India vs Australia 5th ODI Live Cricket Streaming: What is the score in IND vs AUS 5th ODI?